“If only these walls could talk.” How many times have you said or heard that? We could say that about St. John Lutheran Church. The walls of this sanctuary have been here since 1929. That’s a long time. What if these walls could talk? What would they say? I think we would hear stories of God’s grace and faithfulness throughout all these years. 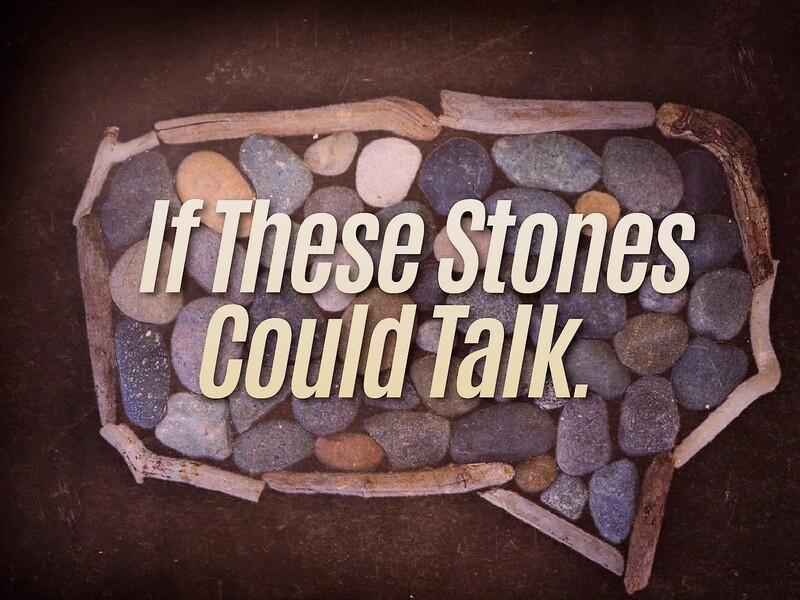 In our gospel lesson this morning, instead of walls talking, we hear about stones talking. The story starts with Jesus making his way into Jerusalem, the city revered as the place where the kings of Israel ruled. The hopes are high. Some believe Jesus is the new King. But Jesus tells his disciples to get him a colt. He deliberately portrays himself as the very opposite of royalty. Instead of gleaming chariots drawn by powerful horses, Jesus arrives on a small, humble animal. Instead of soldiers marching in tight formation, spears and shields glistening in the sun, Jesus arrives with group of regular, everyday folks. This is a large group – more than just the Twelve – who are now following Jesus. Luke describes them as “the whole multitude of the disciples.” This larger group gets caught up in the excitement of the moment. They may not understand the symbolism of Jesus’ entry into Jerusalem that he comes as a humble servant and a king of peace, not as a king who will take up the sword and drive out the Romans. Jesus told his disciples that he was going to Jerusalem to die. Likely, they have forgotten those words. I want us to re-create the excitement those disciples were feeling. Jesus’ followers are declaring Jesus to be the king – and not just any king, but the Messiah, the Christ, the one sent by God to save God’s people. Whatever else the disciples thought about Jesus, they believe this – that Jesus was the one foretold in the Old Testament Scriptures, the one they had hoped for, prayed for, waited for. The Pharisees immediately take issue with these words. They approach Jesus directly and order him to have his disciples stop. It is obvious that these particular Pharisees do not believe that Jesus is God’s chosen one, the Messiah, the Christ. If God has sent his Son, God would certainly tell these educated Pharisees, not fishermen and tax collectors, and every day folks, which is what Jesus’ disciples were. Besides all this, the Pharisees knew that if the Romans heard of any talk of a king, they would send in their soldiers with their swords, and it would be a bloodbath. But Jesus’ disciples are filled with joy and thanksgiving over what they see as the arrival of the kingdom of God. The Christ, God’s son, the Savior of the world arriving in Jerusalem to claim his throne! Their belief in these things makes it impossible for them to keep silent. Jesus tells the Pharisees, you can’t stop these disciples from shouting their praise. Jesus says. “If these were silent, the stones would shout out.” In other words, Jesus is saying, if you silence this authentic act of praise, it will bust out somewhere else. A preacher in a small church wanted to come up with a unique way for his congregation to experience Easter. He decided he would enlist the children in the church to help him. The week before Easter Sunday, the preacher bought enough noise makers for every child in the church. He told them that he wanted them to listen very closely to the sermon and every time they heard the word “resurrection,” he wanted them to blow use their noise makers to make noise. The preacher was delighted as the children entered the sanctuary for the Easter service. Noisemakers could be heard everywhere as people waited for worship to begin. And during the sermon it also worked well. Every time the preacher said “resurrection,” a chorus of noisemakers would fill the sanctuary. It was obvious that the preacher, the children and everyone in the church thoroughly enjoyed the service. But the preacher also noticed that there was occasional unauthorized noise making. Sometimes, when the waiting became too much, when “resurrection” was not heard in a timely manner, a noise maker could be heard. The same is true for the disciples on that first Palm Sunday. Though the authorities wanted to keep control of the shouts of praise — they could not. The praise could not be silenced, and even if it was, praise would erupt from elsewhere. I think it’s worth asking, what silences our praise these days? Why aren’t we shouting praises to Jesus our King, our Lord, our Savior? Is it despair that silences us? We look at the things going on in this world – violence and war and hatred – or the things going on in our lives, and we feel overpowered by hopelessness. Is that what silences us? Or is it the voices of our materialistic culture that tell us we can’t be happy unless we have more stuff or more excitement or a life like we see portrayed in the media or movies? Jesus is saying that when the powers that be, in our world or in ourselves, silence our praise of our King, our Lord, our Savior, then the voices of praise will burst out somewhere else, because this praise cannot be stopped. The Evangelical Lutheran church in Tanzania is one such place. Our Southeastern Minnesota Synod is a mission partner with Tanzania. Since its beginning in 1963, the Evangelical Lutheran church in Tanzania has grown to over 12 times their size and now there are now 6.5 million members. That’s as many members as the ELCA and Missouri Synod Lutheran churches in this country combined. And Tanzania is less than 1/10th the size of our country. Jesus is saying, “Do not think that the powers that be in this world can stop the Kingdom of God. If Jesus’ disciples are silent in one place, praise will erupt elsewhere. They will crucify this King, they will bury him in a tomb, but he will rise from the dead. And all creation will praise the lamb who is slain. For he is our King, our Savior, and our Lord, and not even death can stop his saving love for us. And it is our call to further that praise; it is our call to become God’s living stones – people who, through our worship, love, and lives of serving proclaim Jesus as our Savior, Lord, and King.